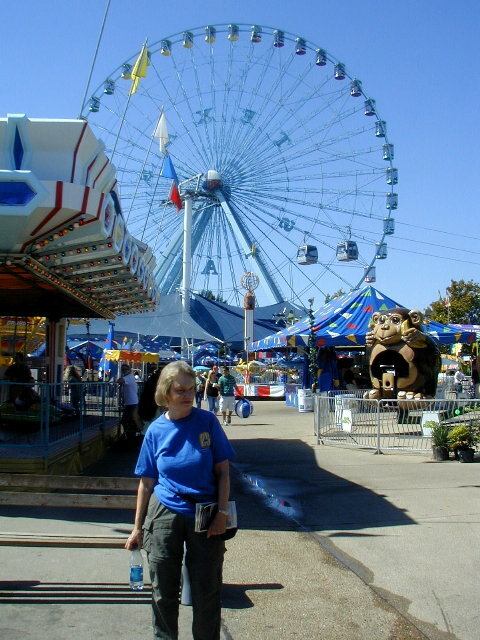 Our first choice was not to go to Big D, but having never spent any time as tourists there, with the State Fair of Texas in session, and with good cell phone coverage so Kay could keep on alert if a problem developed with her mother at Comfy House, we decided to give it a try. It turned out to be more interesting than we expected. We hope you enjoy a short log of our experiences. We left home about 9:45 AM on Tuesday, October 2nd, headed north. We took our back roads route to get from our home in Richmond, TX to IH-45 at Huntsville. The route is: TX-99 to IH-10 to Barker-Cypress Rd to US-290 to Telge Rd to FM-2920 to TX-249 to TX-149 to FM-1791 to TX-30 to IH-45! It may sound like the hard way to get to Huntsville, but it is a beautiful relaxing drive through the countryside on the outskirts of Houston. It may take a little longer, but it sure beats the Houston freeways for a scenic drive. At Huntsville, we proceeded north on IH-45 to near Dallas. At the town of Wilmer, we exited I-45 and took Belt Line Road west. 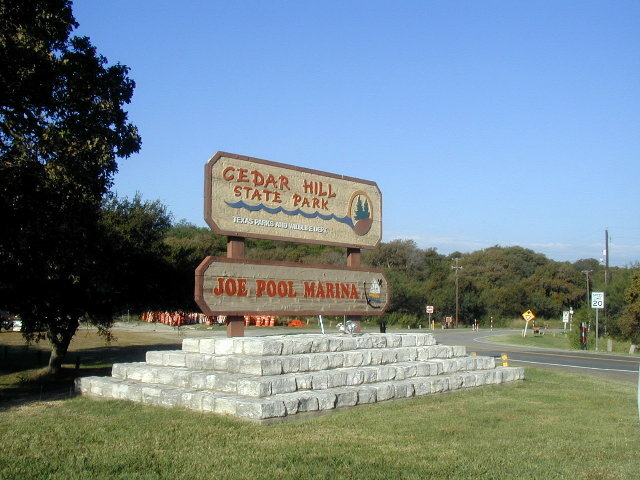 We arrived at Cedar Hill State Park in Cedar Hill, TX about 5 PM. 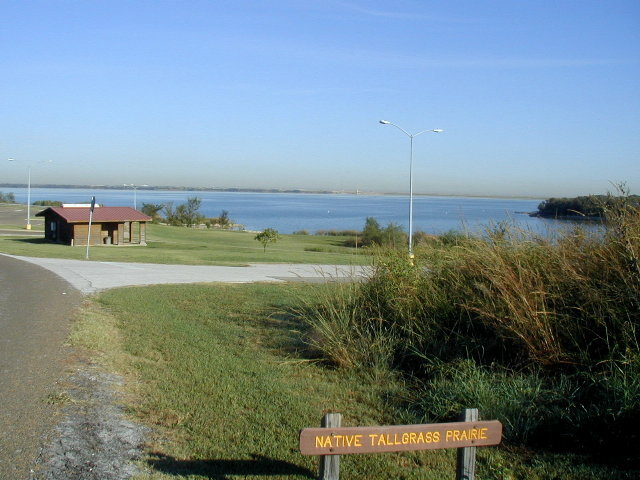 Cedar Hill State Park is located on the eastern shore of Joe Pool Lake, about 20 miles Southwest of downtown Dallas. 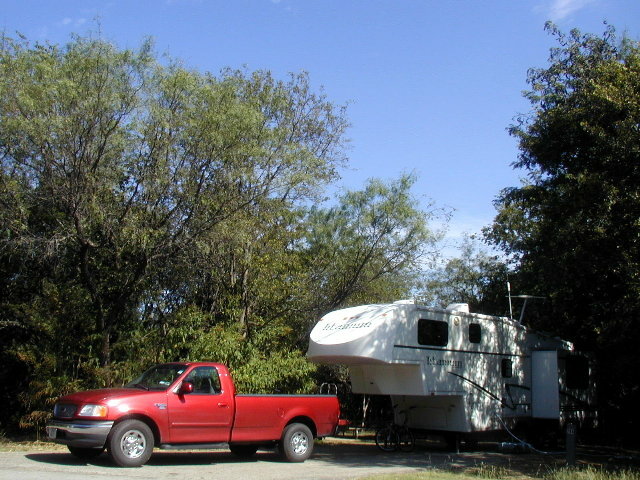 It is a large park, 1826 wooded acres of rolling hills with over 300 improved campsites. It has 19 miles of mountain biking and hiking trails. 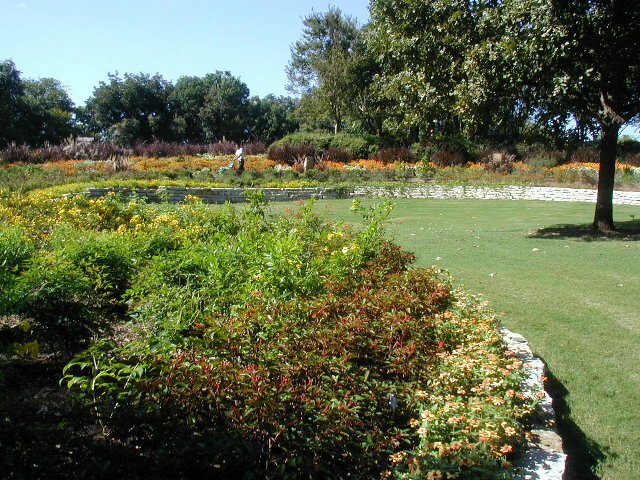 It provided a convenient natural setting for us to explore the big city of Dallas. 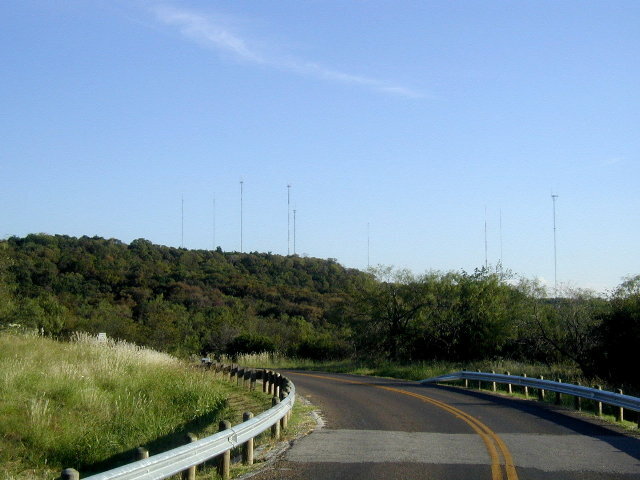 < Entrance to Cedar Hill State Park. < Our campsite at Cedar Hill State Park. We awoke Wednesday morning to find millions of tiny ants inside our trailer in the container of breakfast muffins that was left slightly unsealed on a small seat inside the trailer. Thankfully they weren't fire ants, only a non-biting sugar ant. We spent the next 2 hours trying to serve eviction notices to them so that we could live in the trailer for the next two weeks. We learned from park hosts that the ants are a big problem in the park now for some reason (a reminder of some of the plagues the Children of Israel endured in the Bible) and one of their camping loops was closed because it was too infested with the ants. Lawson went to Home Depot and bought some Sevin powder (at the suggestion of the Park Host) and Raid ant spray to try to keep them under control. By about 10:30 AM we were able to get some degree of control established and decided it was safe to leave the trailer. We drove to a parking lot where we could catch the DART bus that would carry us to the DART rail station. We planned to ride the DART rail downtown. We discovered that the next bus was not going to come until around 1 PM, so we decided to drive to Westmoreland Rail Station instead. We met a helpful DART train operator that gave us good instructions on riding the rail. By the time we got downtown, it was lunchtime so we ate lunch at a Subway sandwich shop below the Bank of America building. From there we walked a few blocks to the Dallas World Aquarium, where we spent an interesting afternoon. The Aquarium's name is a little misleading. The Aquarium is situated on an entire block of downtown Dallas and contains three levels of exotic plants, animals and marine life. It is unique to anything we have seen before. Afterwards, we went back to the West End Rail Station and rode the train (Red Line) to the northern termination (Parker Road in Plano) and back to the other end, Westmoreland Station. We stopped at Wal-Mart on the way back home and finally arrived back to the trailer about 8pm. The ants were still under reasonable control. Whew! A full day! 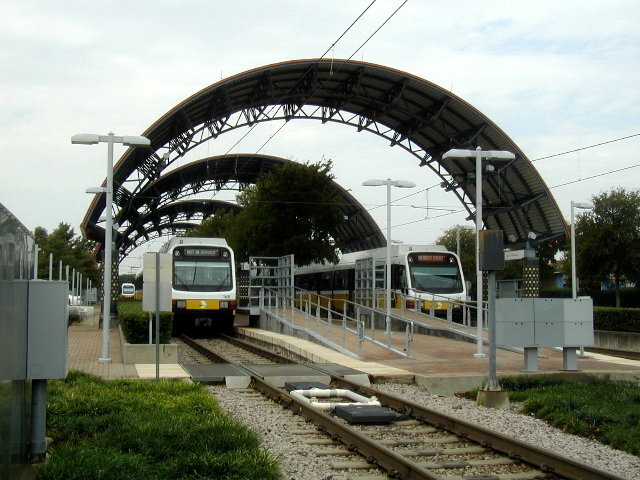 < Westmoreland Station - Dart Rail. 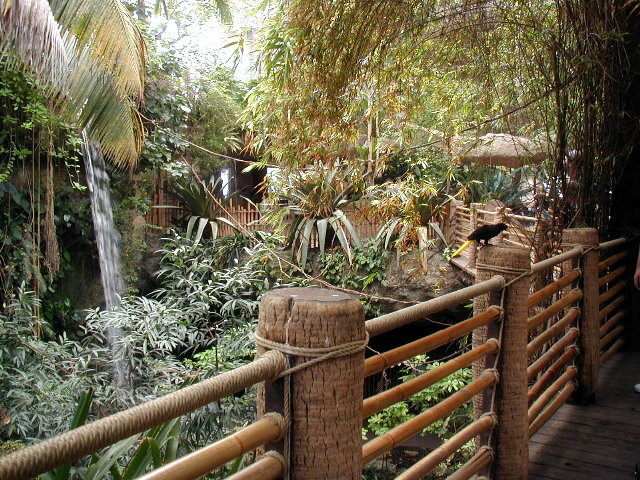 < A three-story waterfall at the Aquarium. 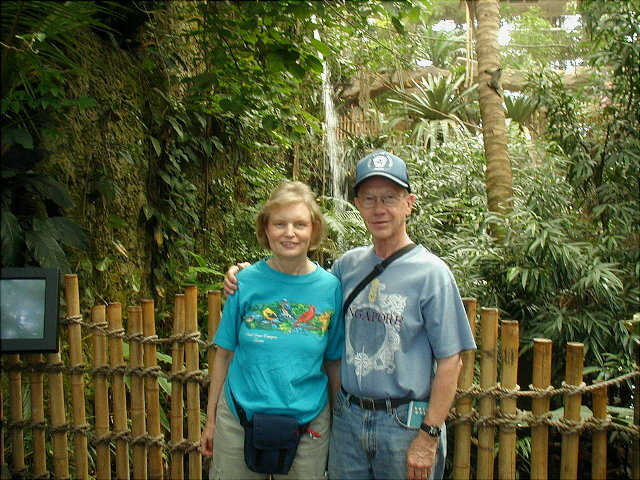 < Kay & Lawson at Dallas World Aquarium. We learned that Thursdays were Senior Day at the State Fair of Texas and that we could get in free that day, so we decided to arrange our Fair days for Thursdays. We rode the DART Rail to the CityPlace Station. CityPlace station is located 10 stories underground beneath the CityPlace building - you have to ride up 3 extra-tall escalators to reach the surface. We caught the DART bus to Fair Park and spent the day there. We also went back the following Thursday. During our two days at the Fair, we wandered through about half the exhibits, trade shows, livestock judging, entertainment performances, food courts and displays. The place is huge and you could never see it all. We saw Dancing with the Dogs, African Acrobats, Italian Juggler, Human Cannonball, Birds of the World, Pig Races, Kitchen Craft demonstration, USMC Drum & Bugle Corps, Milking Parlor Demo, livestock judging, and we ate the prize winning Mama's Fried Sweet Potato Pie and the Fletcher's original State Fair Corny Dog among other healthful foods. This was our first time at the State Fair, and we had a good time, but I think it will hold us for a long time to come. 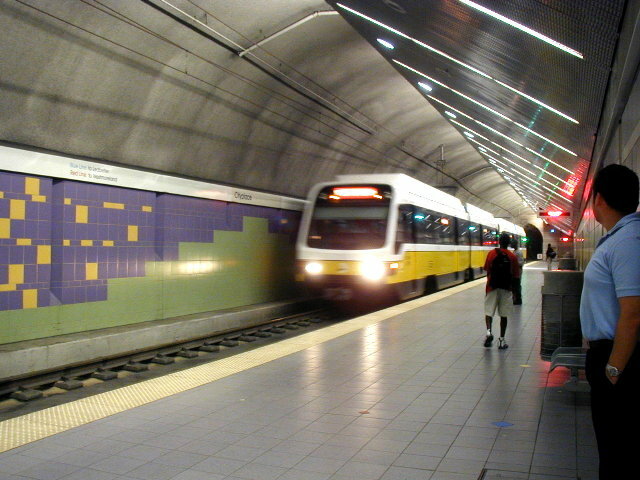 < CityPlace Station - Dart Rail. 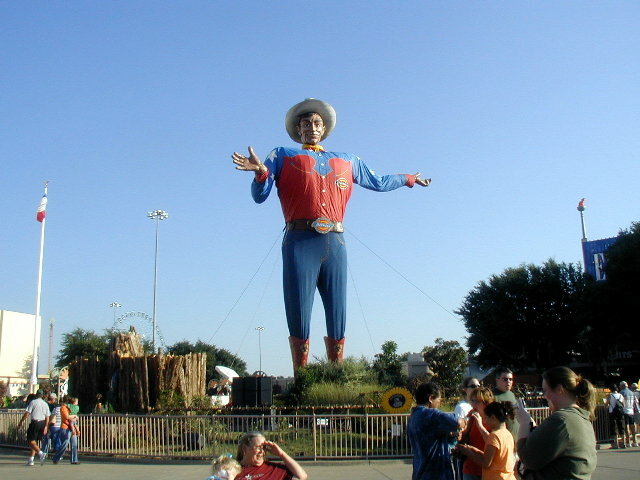 < Big Tex at the State Fair of Texas. 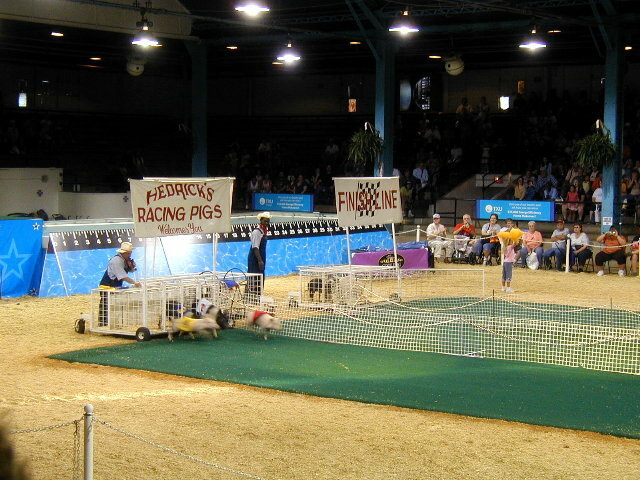 < Pig Races. 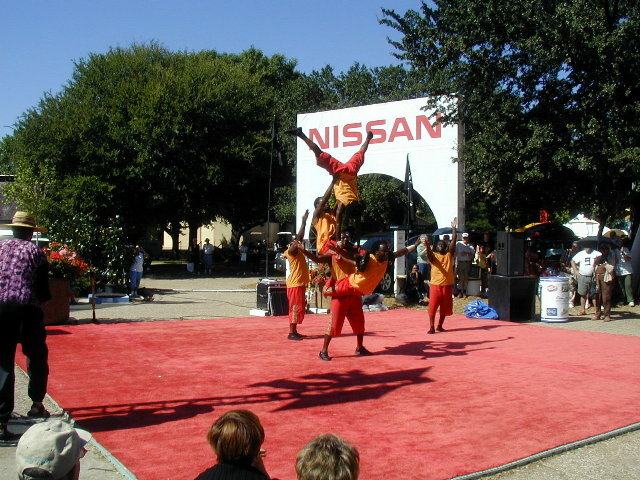 < African Acrobats. 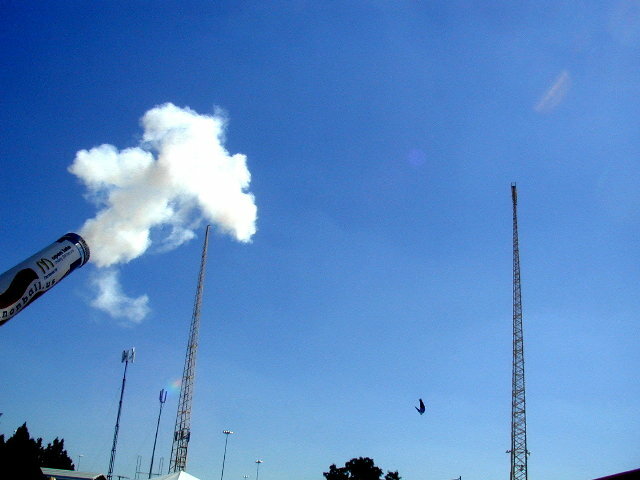 < Human Cannonball. 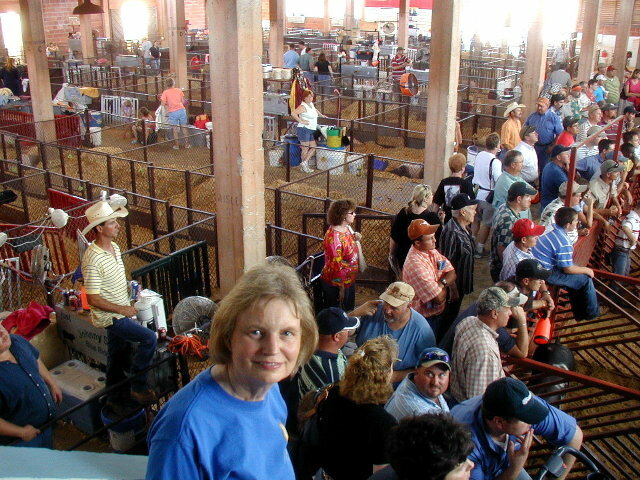 < Kay at the livestock area & Midway. Friday we decided to spend the day in Cedar Hill Park and rest up from all the walking we did the day before at the Fair. In the morning we road our bikes on the roads in the park. We found that riding up hills was a lot harder than riding in Houston on flat ground! We took a look at the mountain bike trails and decided that we would need to hike them instead of riding. < View of Joe Pool Lake. < Park road looking at TV towers nearby. Saturday, we had planned a visit with Kay's cousin Milton and wife Molly at their home in Plano. We drove through downtown Dallas without any difficulty and enjoyed a nice brunch and conversation with Milton & Molly. 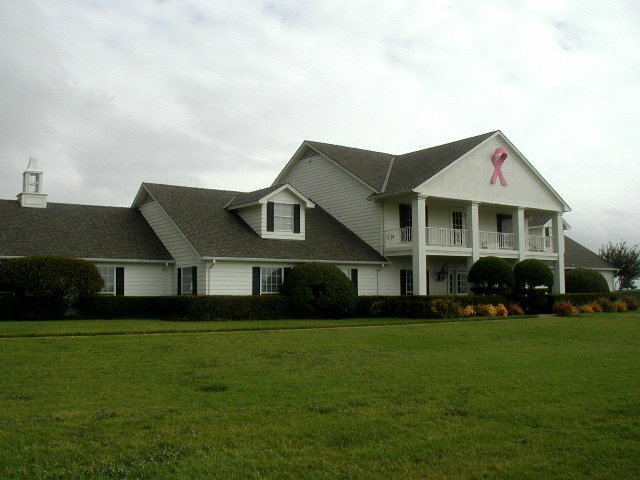 Afterwards, in the afternoon, we toured Southfork Ranch in Plano. This, of course, is the world famous home of J.R. and all the other Ewing oil tycoons. The story of how the home was chosen for the TV show and how they rented it from the owner is interesting and was covered in the museum and by the tour guides at the house. The original owner didn't want to sell the ranch and continued too live in it while it was being used for filming. They shot most of the shows during the summer outside the house. Inside scenes were mostly on a stage set. 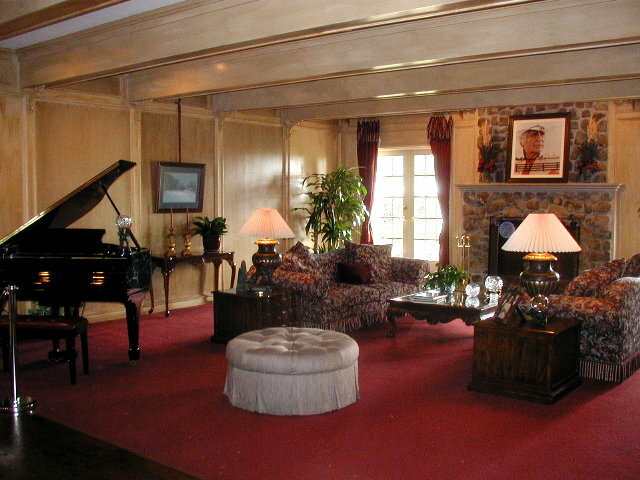 The inside rooms are furnish now as they think would have been appropriate for the characters using them, but most of the rooms were never used in the TV program. We were surprised at the number of folks in our tour group that were visiting from Europe. We drove back to Cedar Hill and hiked on one of the trails to a scenic sunset overlook of the lake. 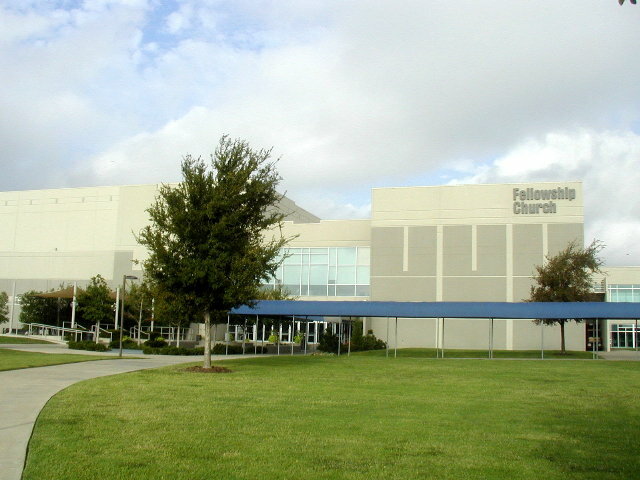 Sunday morning we planned to drive to Grapevine, north of DFW Airport and attend worship services at Fellowship Church. The pastor, Ed Young, is the son of our home church's (Second Baptist Houston) pastor, Ed Young, Sr. We arrived in time to attend the 10 AM Worship Service. After the service, we walked about their facilities and met the people in their media department and got a nice tour of their operations center during the 11 AM service. All the members were very friendly and helpful to us and we really enjoyed the experience. On the way back to Cedar Hill, we stopped in Arlington and ate lunch at a Steak & Ale for our 23rd wedding anniversary lunch. At Cedar Hill, we road our bikes about an hour before sundown through the camping loops next to ours. Monday we rode the train downtown and spent the afternoon at The Sixth Floor Museum at Dealey Plaza. It's a good museum chronicling that tragic event in Dallas & US history. We walked around the plaza outside and saw the X in the middle of Elm Street marking the spot where the President was shot. We finally understood the layout of Dealey Plaza and the motorcade route that took JFK past that building. The John F. Kennedy Memorial Plaza is located a few blocks away. < Panoramic view of Dealey Plaza and the Texas School Book Depository from near the Stemmonds overpass. 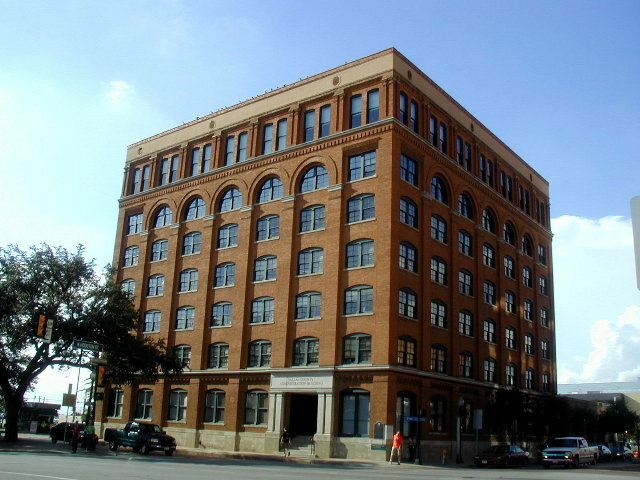 < The Sixth Floor Museum (Texas School Book Depository). Tuesday we rode the train to the LBJ/Skillman station on the Blue Line and ate our lunch while waiting for the #60 bus to take us to the Dallas Arboretum. We spent the afternoon walking throughout the beautiful park located on the eastern shore of White Rock Lake northeast of downtown. The landscaping is outstanding and even though it was late in the season, the colors were outstanding. They were also decorating it with thousands of pumpkins for Thanksgiving. 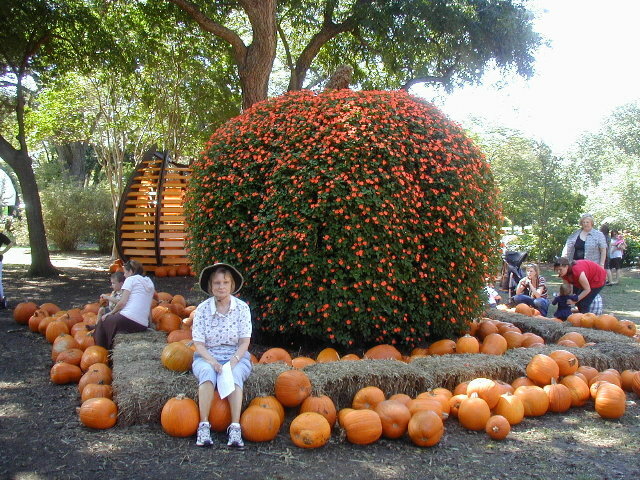 < Kay with the Arboretum pumpkins. Wednesday we stayed in the Cedar Hill Park again. After breakfast we hiked the 2.5 mile mountain bike trail loop to decide if we wanted to try it on a bike. NO! During the afternoon, we toured Penn Farm, located within Cedar Hill State Park. The farm was started by John Wesley Penn in 1859. 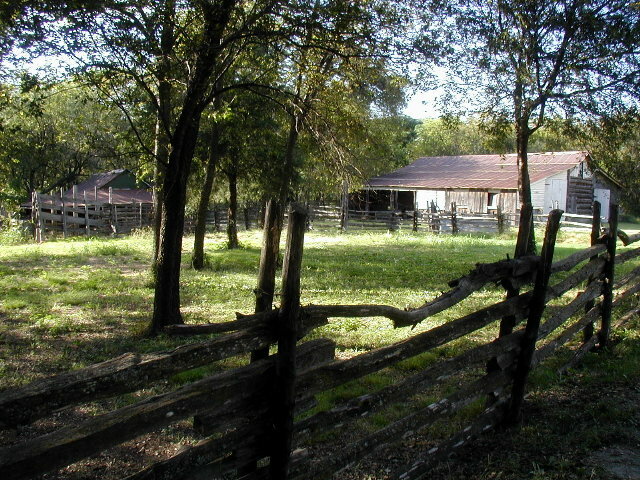 Penn family members lived on the property and operated their stock farm until 1970. 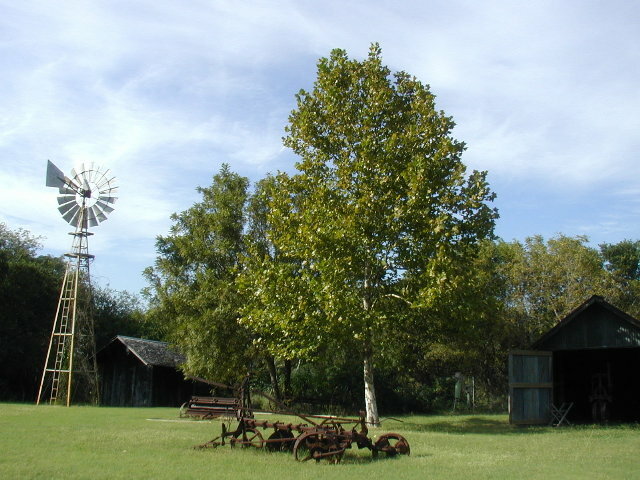 Many of the original buildings and farm implements are still standing. Thursday we rode the train back downtown to Union Station and caught the bus to the State Fair of Texas. We spent the day there until almost sundown and saw all the things that we had missed the last Thursday, and ate a few more healthy Fair fried foods! Friday we spent our last day in downtown Dallas. We walked through the 4.2 acre Pioneer Plaza, located at the Dallas Convention Center, to see the largest bronze monument in the world, and the largest contiguous open space in downtown Dallas. 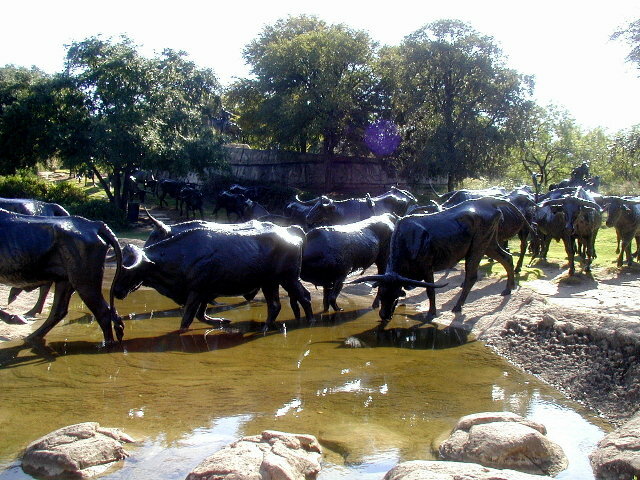 The display depicts the historic longhorn cattle trail drives of the mid-to-late 1800's. 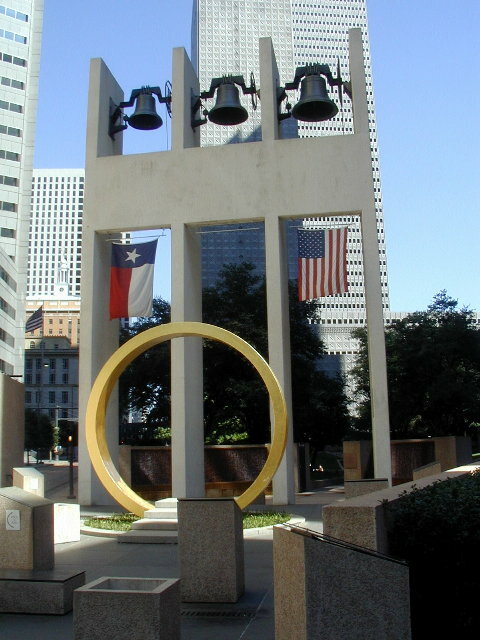 Pioneer Plaza commemorates Dallas' beginnings by celebrating the trails that brought settlers to Dallas. We then walked through the downtown Neiman Marcus, Adolphous Hotel, and the JFK Memorial. 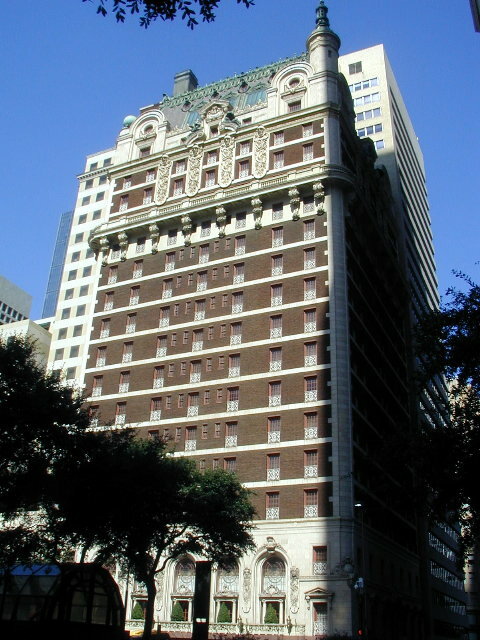 The Adolphous Hotel was built in 1911-12 by Adolphous Busch, co-founder of the Anheuser Busch Brewing Company. Someone on the street told us that a free lunchtime jazz concert and sandwiches was going on down the street, sponsored by AT&T, so we decided that was a good place to eat lunch. It was a very good concert and the sandwiches were tasty too. In the afternoon we toured the Old Red Museum. 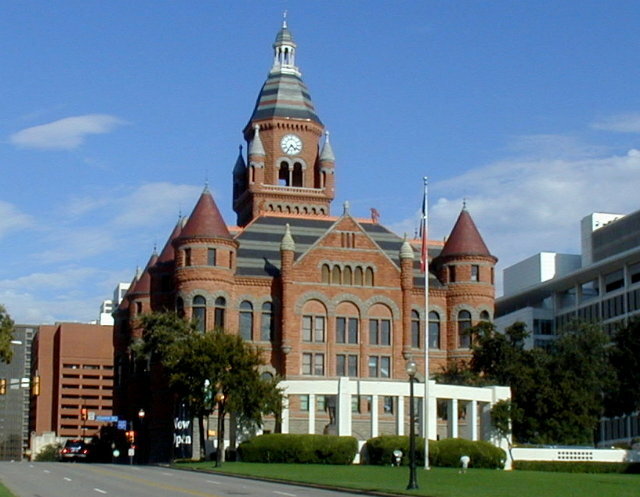 It is located in the 1892 Courthouse near historic Dealey Plaza. This is a very good museum to give an understanding of Dallas history. There are 4 different movies that do a very good job of explaining the early history of Dallas. Before we left downtown, we walked through Thanks-Giving Square. 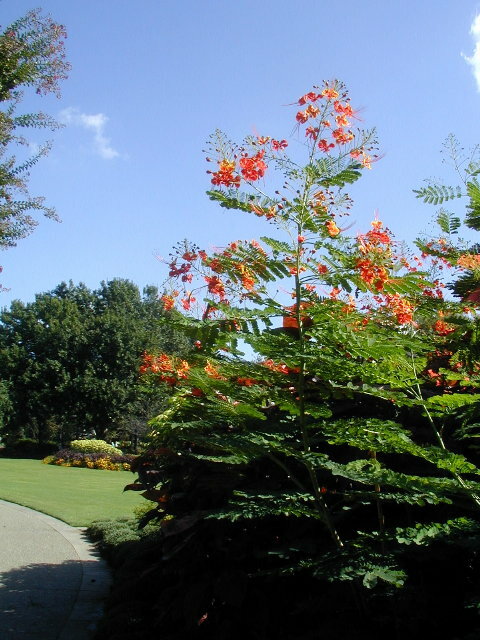 This is a beautifully landscaped Christian themed inspirational park in the heart of Dallas. The shade trees, passages from the Bible and running water features makes an ideal spot of office workers to take a relaxing break. Every town in the country should have a Thanks-Giving Square. We all certainly have been blessed. We rode the Blue Line to downtown Garland, then back to Westmoreland Station, after switching to the Red Line at Mockingbird Station, just to see all the rail routes. We didn't go to the Hampton Station on the Blue Line, at the advice of our helpful train operator, who said that there wasn't anything for us down there. < Pioneer Plaza. < Adolphous Hotel. < Old Red Museum. < Thanks-Giving Square. Saturday morning we retraced our route from Dallas back to Houston. This draws to a close our short visit to the "Big D" Dallas. We hope you enjoyed the photos and brief descriptions of our activities. God willing, join us again soon for another RV adventure.